It’s easy for a top-level view to get all the touch gestures (taps, drags, pinches, etc.) it needs, because the system knows to send all UI info to top-level views first. By “top-level,” I mean leaves (leafs?) of the subview tree of your one UIWindow object, which is usually called window as an instance variable in your app delegate. It’s also easy to respond to touches if your view is a superview of a top-level view receiving touches. For example, suppose you built a custom view – let’s call it DragView – that responds to dragging, and this view contains a button as a subview. If the button is disabled and the user touches the button, the touch is still noticed by the underlying DragView. In any case like this, by default, your “underneath” view will not get any touch information, because it will never be in the responder chain. By the time touchesBegan: and friends get called, the touches have been filtered and bound to only include touches within the leaf subview. 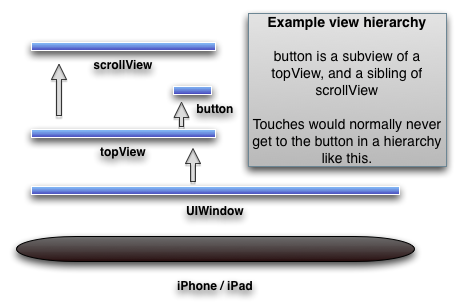 If there were multiple touches, some outside that view, they would be split into different touchesBegan: (etc) calls, which can make things much less efficient or impossible depending on your exact view layout and complexity of touch actions. The standard UIKit controls ignore all forwarded touches. They know it was forwarded by checking the view property of the UITouch objects sent in, which is set (aka “bound”) to the bottom-most leaf subview containing that touch before the call to touchesBegan and friends. In summary, event forwarding can drop touches and simply won’t work for the built-in controls. This approach can be useful for custom subviews, but I’m going to give a generally better solution here. The way to handle this is to inject code into the event-handling pipeline before touchesBegan (etc) is called. You can achieve this by overriding hitTest:withEvent: on any common superview. In the figure above, this object could be topView. This solves the above problems by taking control before the event is filtered and bound to another view. It will end up being bound to whichever view you return. Note that your hitTest: method will only be called for touches that occur in the view of that method. This entry was written by Tyler, posted on June 14, 2010 at 10:52 pm, filed under gotchas, UI code tips and tagged hidden views, hitTest, Responder chain, underneath. Bookmark the permalink. Follow any comments here with the RSS feed for this post. Post a comment or leave a trackback: Trackback URL. This is a very good post on hit test. Well done! Very helpful to understand hitTest etc. I tried to use this trick. Instead of interact with a button, I want to interact with a UIWebview. but could not make it work. I could not click on the link on the webview. Could you please help? thanks again. [myView addSubview:myButton]; // Important that it’s called second! Views added later are “on top of” earlier views, analogous to applying paint to a canvas. * UIWebView does not play nicely with touches. If you think about it, when a user touches down in a web view, are they going to scroll or tap a button? There’s no way to know immediately, so instead of passing through the touch information, I think UIWebView holds on to it for a moment to wait for the user to scroll (or not). UIScrollView does the same thing. In summary, UIWebView may be behaving in ways that other views do not. Perhaps this is part of the problem? You could check by temporarily replacing your UIWebView with a UIButton to see if that fixes things. which prints out the name of the current function. This is a very handy line to put in methods that aren’t working – always good to check if they’re being called at all! And you could use more NSLog’s, or add a breakpoint at that function and step through it to see what’s going on. I see your post used as an example by many online. Thx for putting something up on hittestwithevent. There aren’t too many posts on this online. I have a question about hittest which i posted on stackoverflow but no one can answer. I’ve seen it asked a few times actually but still no answer. I have a UIScrollView with no subviews. When I touch the scrollview, i see its hittestwithevent called 3 times. Why is it 3 times and not 1? Hi @David; I spent a few minutes investigating your question, but I couldn’t find a definitive answer. I did find some clues that might be helpful, which I’ll post in reply to your stackoverflow question. Let me know if you figure it out! Clear, concise, and clean. Thank you! Thanks for your post! It was really helpful, I was able to solve a problem and learn from it a lot! Great, thanks very much for a detailed post… The graphics are really helpful too.